Have you ever visited the Caves of Camerano and drank a glass of Rosso Conero while enjoying the beautiful view of the hills? Imagine a town on the hills made of alleys, squares and people enjoying the sun sitting on wooden benches. Imagine a country whose history began in the third millennium BC with a small village of huts made during the Piceno period and that today it will tell you stories of families and stories of wine. This is how Camerano looks: a village on the hills where the sun illuminates the wheat fields and the beautiful vineyards from which we get the delicious bottles of Rosso Conero. Here you always have the feeling of walking in a country that has remained tied to its identity. Get here from Ancona it is really simple, it takes less than 15 minutes, along a beautiful road flanking the sea and the countryside. Camerano will give you the pleasure of the scented air and of views from the countryside down to the sea, Camerano will give you the pleasure of a glass of Rosso Conero, an authentic wine full of fragrances. Do you love art? In the Parish Church of Camerano you can admire the beautiful painting Madonna and Child with St. Dominic and St. Augustine and his mother Monica painted in the seventeenth century by the painter Carlo Maratta. 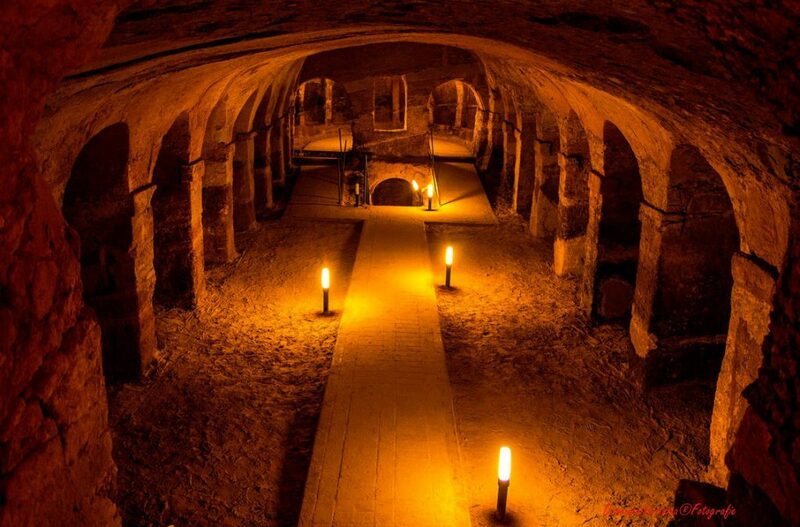 If you want to have a special experience then you must visit the Caves of Camerano. These are called “caves”, but this word does not give the right idea of what you will see. In this village on a hill kissed by the sun, it extends a real underground city whose history is still shrouded in mystery. A parallel city of the colour of sand, decorated with corridors, tunnels, vaults, elaborate columns and bas-reliefs. It is likely that the Caves of Camerano were a place of worship, dear to people as there are two underground churches here below. A place of worship, for sure, and of gathering, but also a safe place to take refuge from the attacks and invasions such as during the bombings of 1944. If you are deciding to visit Camerano and you love wine you should not miss the Rosso Conero Festival held every year since 1995, in the first days of September. During this festival the town is filled with stalls, jugglers, magicians and dishes beloved to the tradition that accompany the presentation of all the best Rosso Conero wines of the area. An advice? Try a red wine biscuit paired with a glass of Rosso Conero … we are sure you will enjoy it!